Here's the latest in releases from Konami. 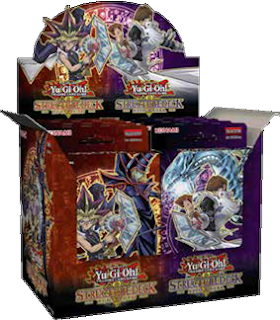 Place your orders for the Yugi Muto and Seto Kaiba Structure Decks before August 8, 2016 with us by calling, emailing, or messaging your order. Decks are $9.99 and they release October 21, 2016. Konami Digital Entertainment, Inc is proud to bring you the newest product offering, Structure Deck - Yugi Muto and Structure Deck - Seto Kaiba! Are you on 'Team Yugi' or 'Team Kaiba'? Pick a side, because it's time to Duel with more of Yugi and Kaiba's classic cards and strategies reborn for the modern era of Dueling in Structure Deck - Yugi Muto and Structure Deck - Seto Kaiba! In preparation for the Battle City Tournament, Yugi developed a new strategy using Magnet Warriors - monsters that could combine to form one huge monster whose power could rival even Kaiba's Blue-Eyes White Dragon! Structure Deck - Yugi Muto refits the Magnet Warriors into new Electromagnet Warriors that attract each other from the hand, Deck, and Graveyard, and combine into the mighty Beserkion the Electromagna Warrior! Duelists can play these new cards on their own, but if they use them with the original Valkyrion the Magna Warrior they can Summon the new Imperion Magnum the Superconductive Battlebot, a 4000 ATK bruiser that can also negate your opponent's Spell Card, Trap Card, or monster effect. Most Duelists in the Battle City tournament could only use their monsters to attack and defend; Seto Kaiba built his Deck using monsters that could change into Equip Spells to power up and protect each other! Structure Deck - Seto Kaiba revamps the original XYZ-Dragon Cannon Union strategy and introduces 3 new combining mechanized Union monsters: A-Assault Core, B-Buster Drake, and C-Crush Wyvern! These new monsters have new and improved Union abilities and extra effects that help you assemble all 3 on the field. When you do, you can combine them to form ABC-Dragon Buster, a mechanized war machine that can banish any card on the field during either player's turn! Duelists are rewarded for using the original XYZ-Dragon Cannon, also available in this Structure Deck, alongside the new ABC-Dragon Buster with the option to combine the two into A-to-Z Dragon Buster Cannon - a 4000 ATK monster that can attack, and then immediately split back up into its component parts to attack two more times! Each Structure Deck comes with a 40-card Main Deck and a 5-card Extra Deck for a total of 45 cards (40 Commons, 3 Super Rares, 2 Ultra Rares).